Indulgence is a WordPress theme best suited for restaurants, cafes, or basically any food related small businesses out there who realized that internet is the perfect place to reach out to their potential customers. 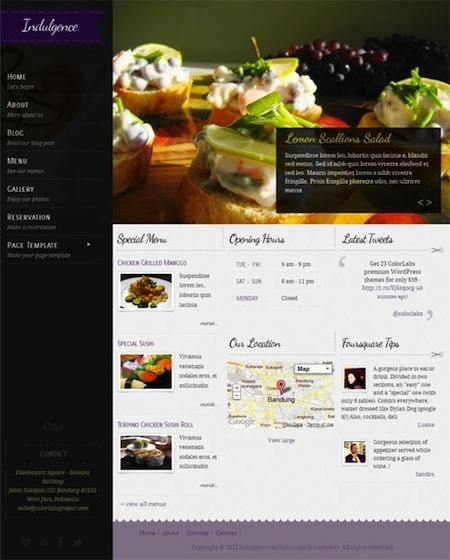 WordPress makes it easy and inexpensive to create a professional and attractive website and Indulgence is the perfect WordPress theme for restaurants, cafes, pubs and bars. Indulgence homepage showcases your featured foods, menu items, business/open hours and your Google Map location. Indulgence use images in a variety of ways that put the focus where it needs to be, your food. The design does a great job of providing a high-quality atmosphere. From adequate white space, a clean and neutral background and limiting the number of different fonts used on the site, all these elements allow the food to take center stage.